This is a picture of what aroused my curiosity in collecting teapots, even though this isn’t actually a teapot, but a hot chocolate pot. My first husband and I were driving home from Athens, Ohio where he had gone to school and we stopped at a “antique shop” . It was probably 1974. I had never seen anything so beautiful to serve tea from. 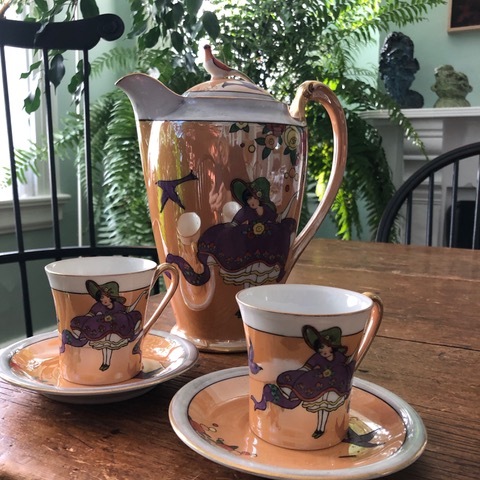 From the luminescent glaze to the fanciful bird perched on top of the lid, this Japanese art nouveau inspired beauty is why you see the hundred or so teapots poking in and around the BonBonerie. I am surprised I haven’t broken it and it has travelled to at least four of my residences. I always preferred tea over coffee, even as a college student. It was usually brewed from a Lipton teabag in a mug, though. My mother had one beautiful hot chocolate pot, which we drank tea from as children on very special occasions. It was beautiful, but lived in the back of a cabinet most of the time. Recently I read an article that reinforced my own observation. Studies have shown that food and drinks served on beautiful dishes and glassware actually taste better to the person eating or drinking them. I compare it to dressing up for a special event, elevating the experience above the ordinary days of our lives. If you think about how difficult and expensive it was just 100 years ago to acquire sugar, candied fruits, chocolate, even butter and cream, you can see why even cakes earned a special stand to sit upon to be presented from after dinner and yes , I have become quite a collector of those as well as you can see looking around the bakery. In the 1700’s tea started off as very expensive and sought after beverage. Mistresses of the house used to carry the keys to their tea chests where the tea leaves were locked up and no one had permission but the mistress herself to open it. What we have valued due to scarcity and cost is the motivation behind so may beautiful objects in the culinary world. Back to my collection of teapots, however. I thought I would share with you in the coming month the stories of some of my favorites. The second one I am sharing today is from my Mother, Eileen. After I opened the tearoom down the steps from the bakery, she began her retirement traveling around the world when she could. 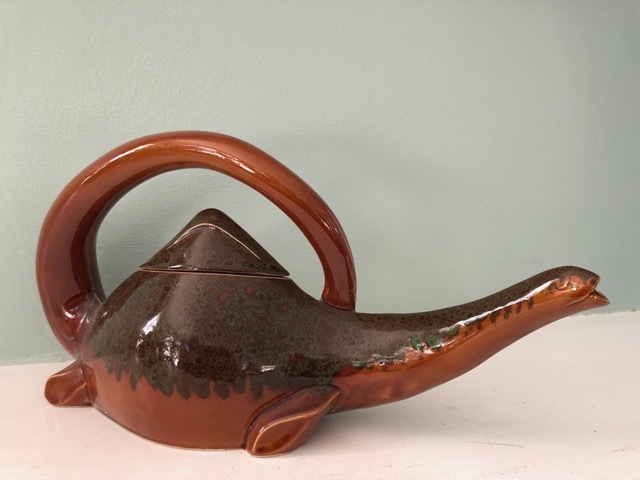 This unusual teapot that looks like a dinosaur is actually an artist’s rendering of the Loch Ness monster. I have never made tea in it actually, but I love that my Mother brought it all the way back in her suitcase from Scotland for me.